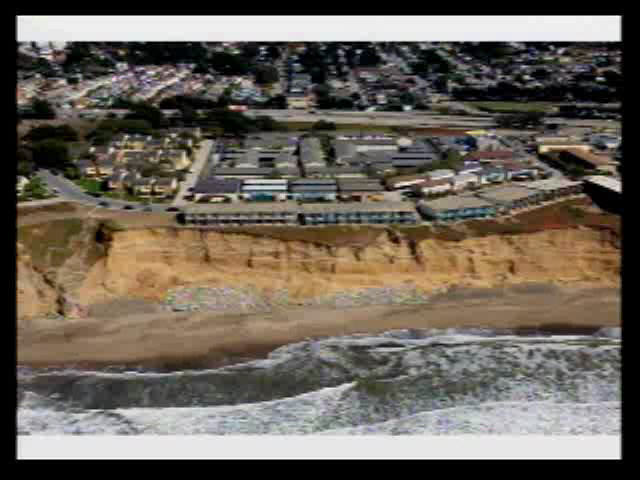 A look at the work done to halt erosion behind 330 Esplanade, and the dramatically undercut patios behind 320 Esplanade. 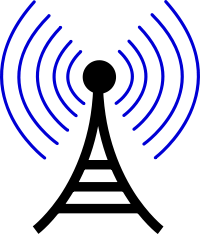 During the Study Session hosted by the Pacifica City Council on February 10th, one of the possible funding sources that was discussed was an Army Corp of Engineers program called “Section 103”. You can see Section 103 for yourself here, or hit the More link below for the full text. 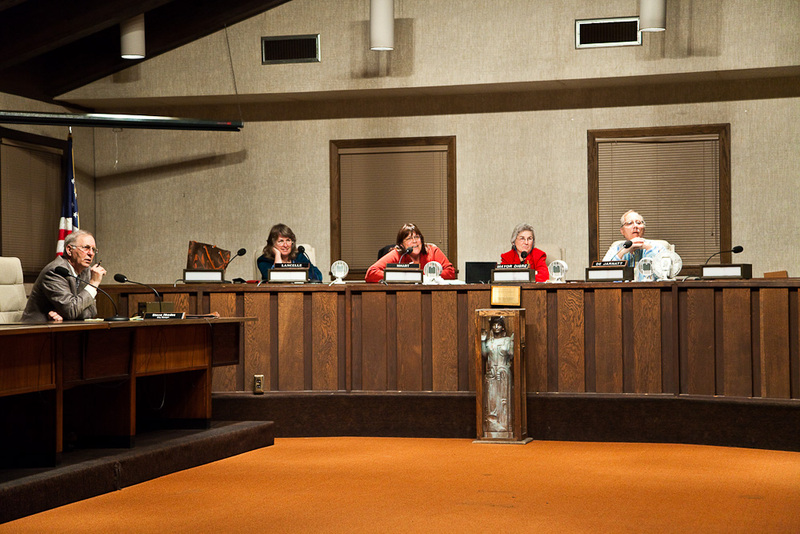 After passing a pre-selection assessment, a municipality can request a feasibility study. The first $100K of the study is fully Federally funded, but all work after that is paid in a cost sharing arrangement with the local municipality responsible for 35% to 50% of the total, and a cap of $3 million. 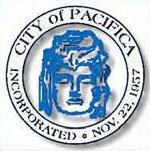 The sense at the Study Session was that no solution that might require funds from Pacifica could be considered. 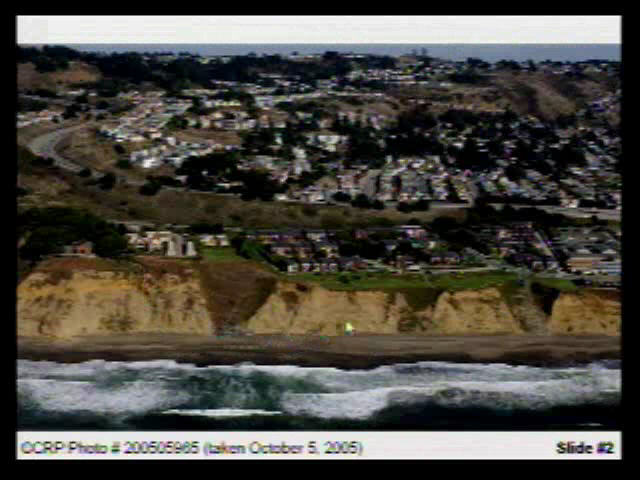 It is possible that the Army Corp of Engineers could start a study with no promise of actually doing the work, as was reported in the Feb. 18 Pacifica Tribune story on MercuryNews.com Cliff issues explored in city study session; Agencies offer assistance explaining procedures and permits. This seemed unworkable at the Study Session, though I suppose nothing was ultimately ruled out. Adopt Proclamation Confirming Existence of a Local Emergency (Proposed action: adopt proclamation confirming existence of local emergency). 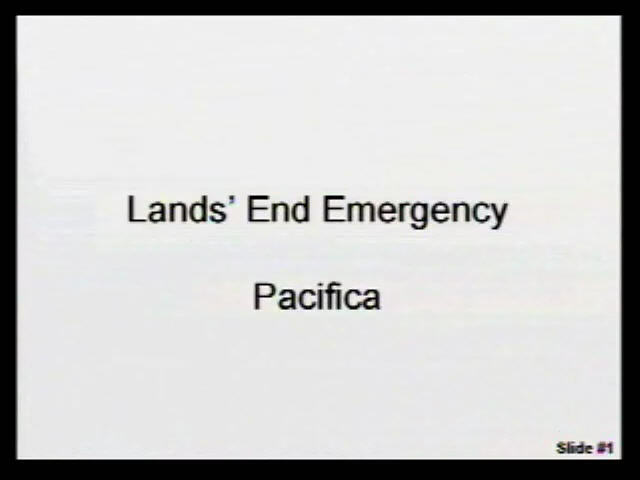 For more information see my post Pacifica Declares Local State Of Emergency. Adoption of Resolution Initiating Historic Landmark Designation Process for the Dollaradio Station, 100 Palmetto Avenue (Assessor Parcel Number 009-401-060) (Proposed action: move that the City Council adopt the resolution next in order initiating the historic landmark designation process for the Dollaradio Station). 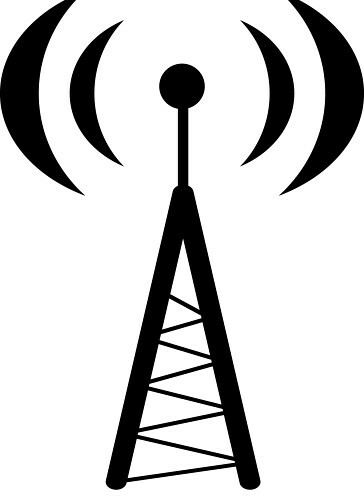 The Dollar Radio (Dollaradio) property on Palmetto Ave. does have an interesting history, see my post Sampling Dollar Radio’s History. Both of these actions seem to be intended to make it easier for property owners to obtain funding outside of the municipal government or local agencies. 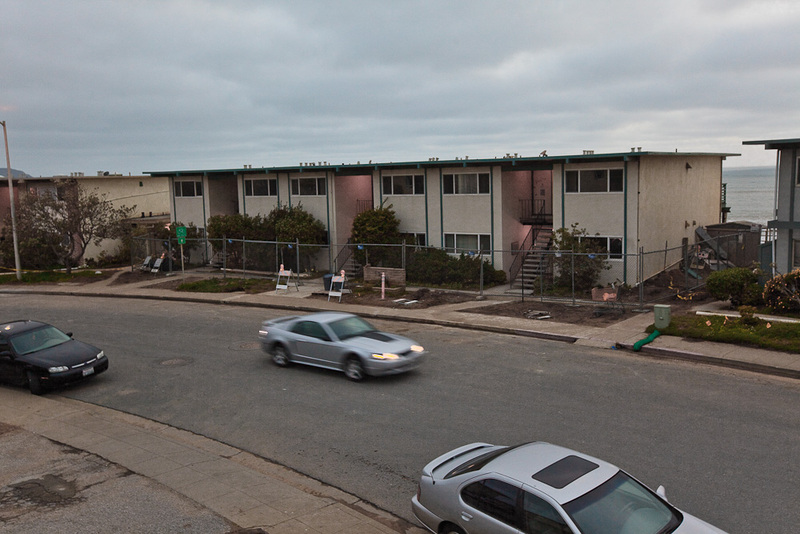 During the Study Session hosted by the Pacifica City Council on February 10th, one of the possible funding sources that was discussed was an Army Corp of Engineers program called “Section 103?. 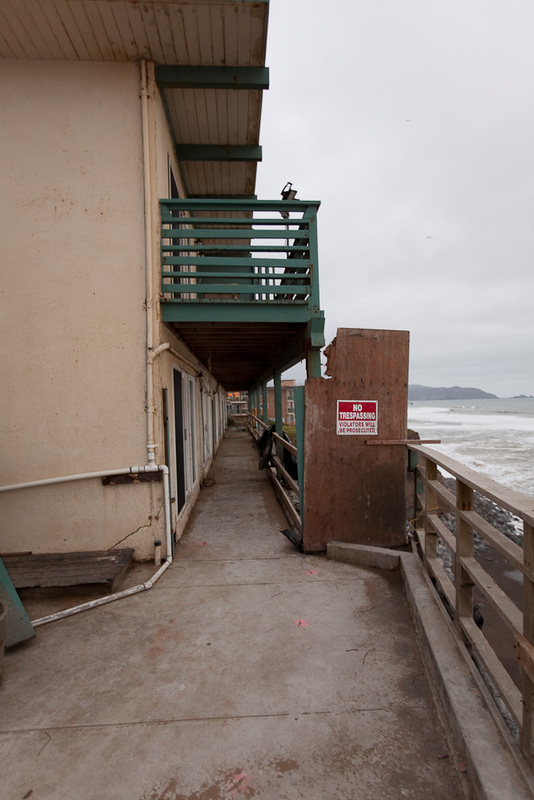 The main drawback of the Section 103 program seemed to be that even though an initial project analysis could be funded with federal monies, 35% to 50% of the overall expense would have to be paid by Pacifica or a local agency. The consensus at the Study Session seemed to be that requirement for local funding was a non-starter. You can see Section 103 at my post US Army Corp of Engineers, Continuing Authorities Program, Section 103. Work behind 330 Esplanade stopped Monday or Tuesday 2/15 or 2/16, and the crane required to do the work was removed. 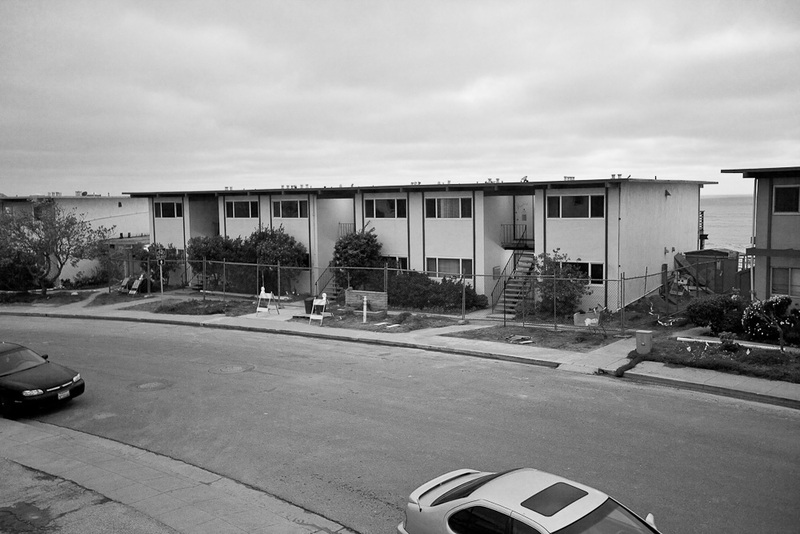 Some people may be happy for the peace and quiet, but the very real problems faced by the remaining residents and landlords are just waiting to get worse. 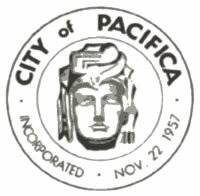 Use the link above to see the original PDF file on the Pacifica website, or click “More” to read the text of the Proclamation here. We’re not in a position right now where our streets or utilities are going to be immediately at risk, but we wanted to help the property owners as much as possible. The city’s proclamation covers an the area from Manor Drive to Muscle Rock on Palmetto Ave., and must be approved at various governmental levels up to and including the Governor. 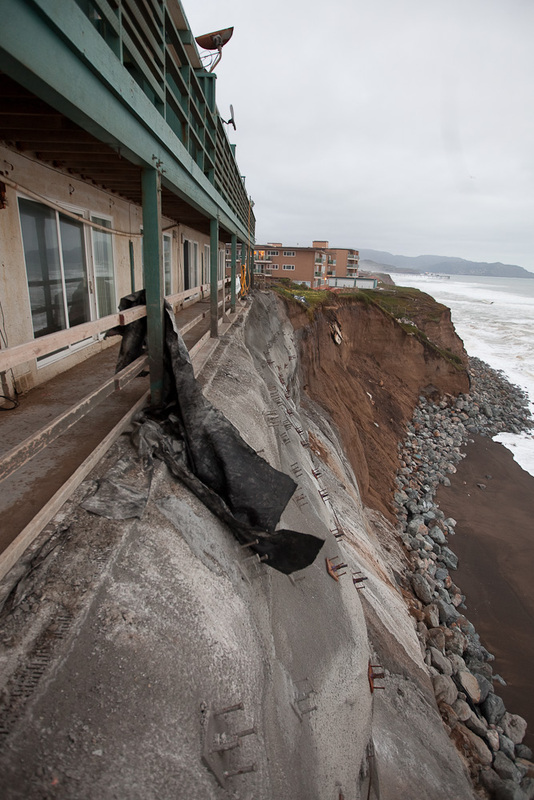 If approved, it would allow: owners to apply for low-interest Small Business Administration loans; and, additional work to be undertaken immediately without the Coastal Commission’s approval. 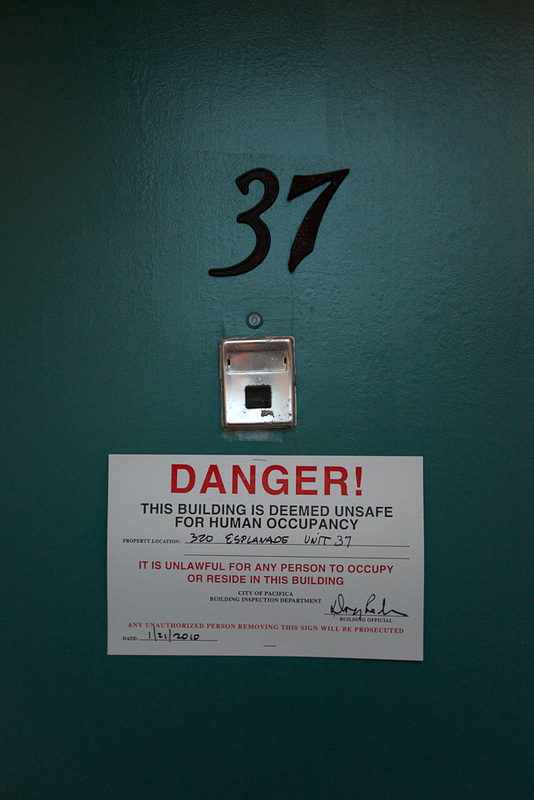 The Federal Emergency Management Agency has repeatedly denied the Esplanade area’s elibility for aide due to the threat being to only private property, and to long-standing pre-existing conditions. 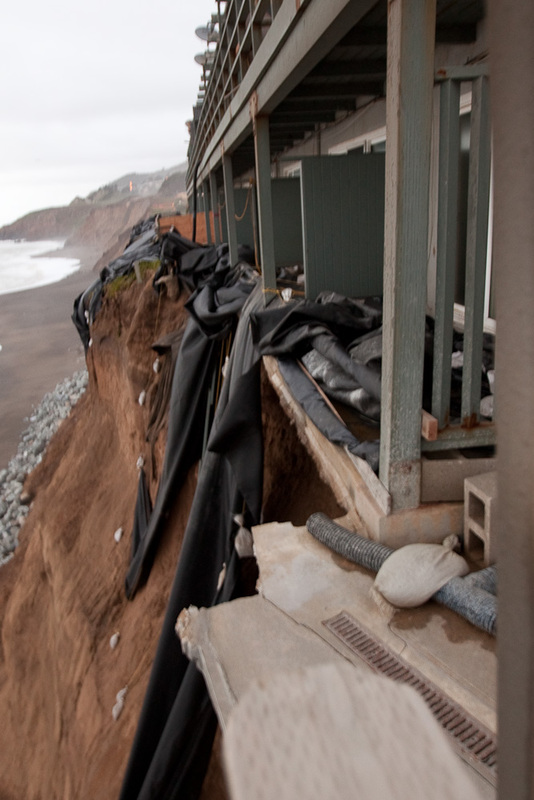 According to today’s KGO-TV 7 (ABC) story Crumbling cliff in Pacifica prompts new precautions, two more owners are taking action to delay or stop the erosion that threatens their properties along the bluffs in Pacifica. To buy her time, it’s not a total fix, what it is buying her time. Hopefully in a couple of years they can make a decision. She has a lot of property here, she can move back. They are talking about moving to a house down the road possibly – something like that. 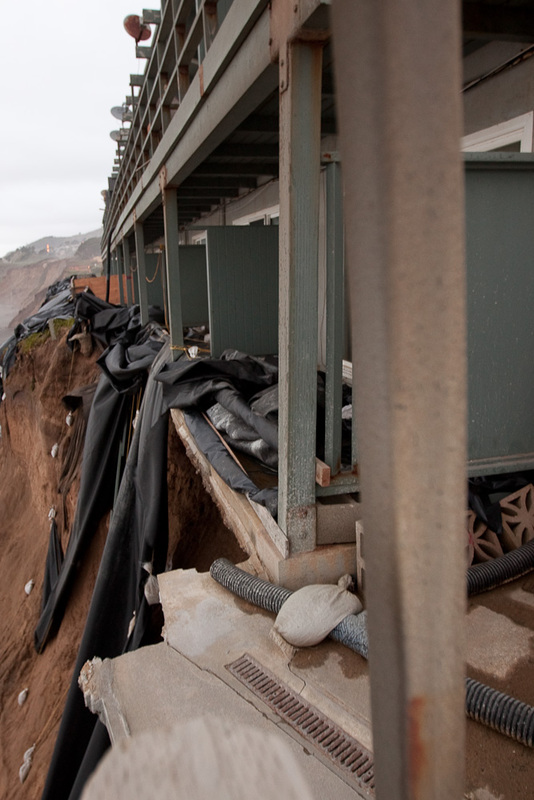 Meanwhile I have heard that the owner of 310 & 320 Esplanade will have bluff reinforcement work begin on his properties shortly. No word on the status of the Pacific View Villas condo complex on Palmetto Ave.
Joan Levin owns a historic home just north of Pacific View Villas condo complex on Palmetto Ave. 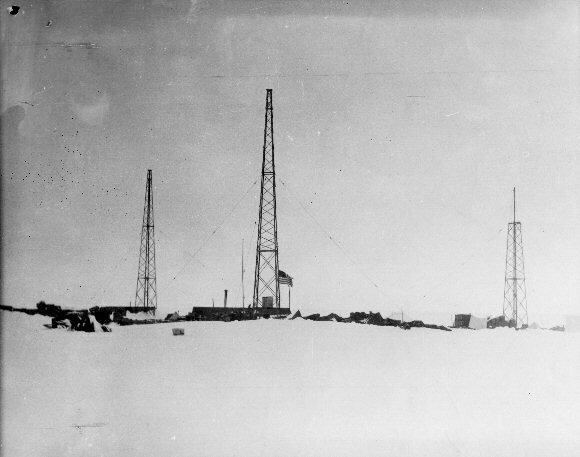 The property was once site of Mussel Rock, 6XBB: Dollar Radio (Dollaradio), an early radio communication site with many notable “firsts” in communications with ships in the Pacific. The original tiny 20 feet square wooden structures were replaced with red brick buildings in about 1930. The two 225+ foot tall towers were demolished in the 40’s, but one brick building lives on as part of the residence. 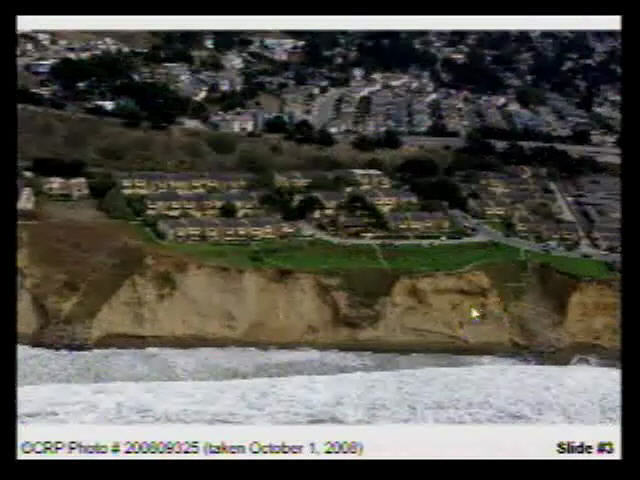 Frames grabbed from the video of the California Coastal Commission Meeting Feb 10, 2010. 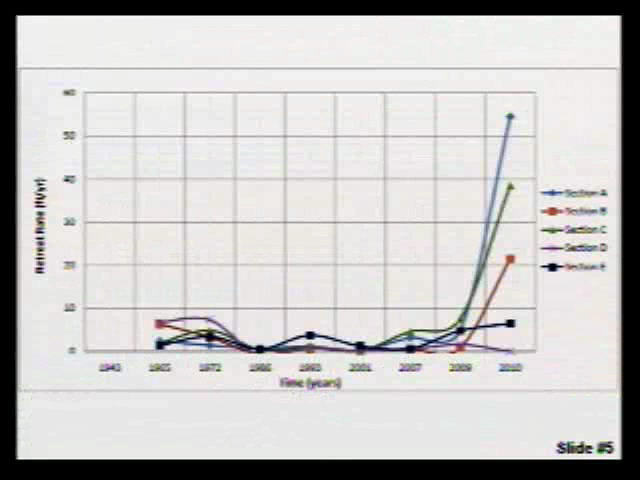 You can see the agenda with links to the corresponding segment of the archive video here. 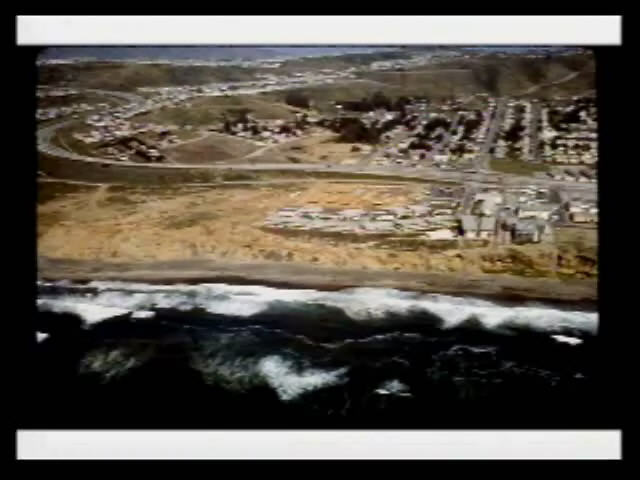 You can see a list of all of the archived videos on the CAL-SPAN Coastal Commission Archive page. 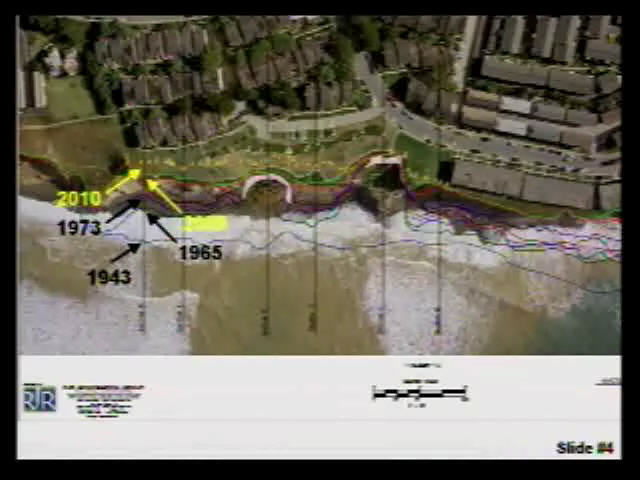 Lands End coastline diagram showing bluff line from 1943, 1965, 1973, 2005 (? ), 2010. 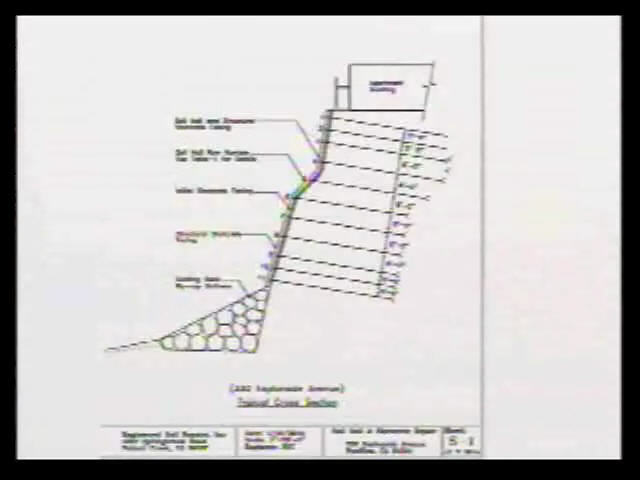 Shows the encroachment on building 112 clearly. Click any picture to see a larger version. 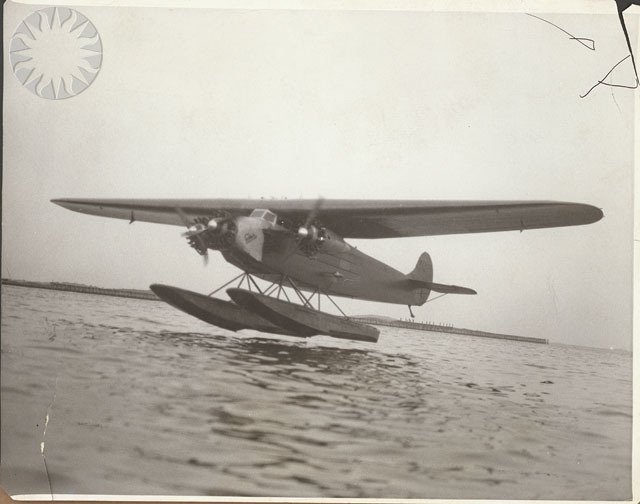 Click the left or right side of a picture for the next in the set. 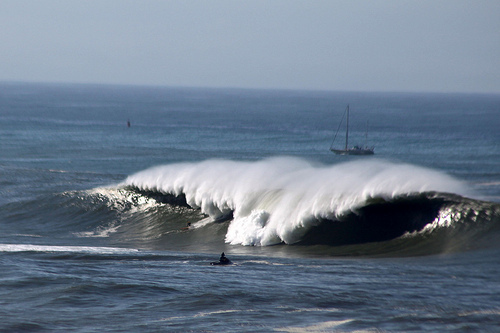 The Maverick’s Surf contest is ON for Saturday, February 13th. 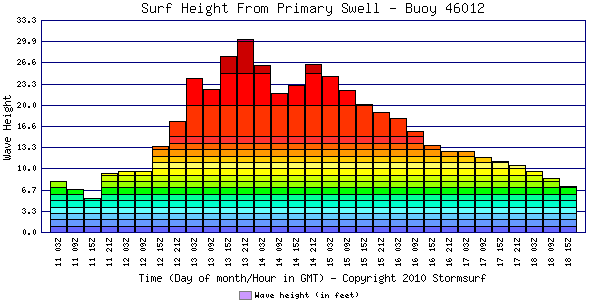 See MavericsSurf for details and live streams. 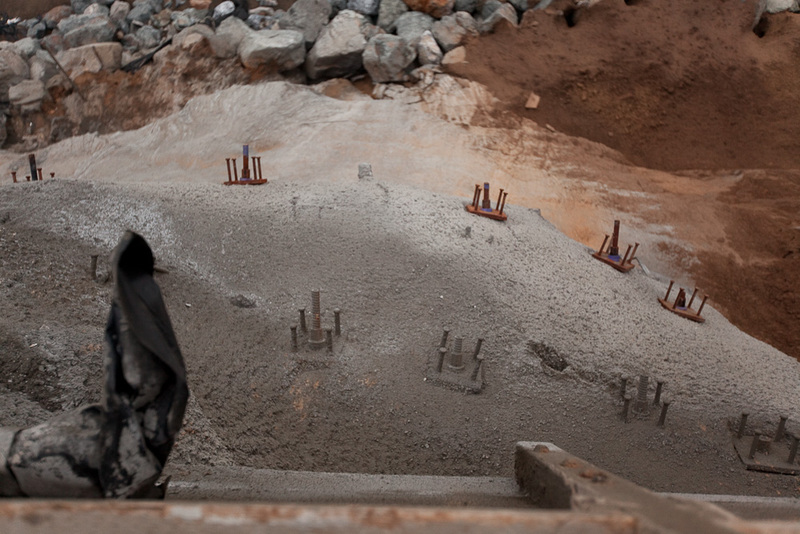 The first heats are scheduled from 8:00 AM on. 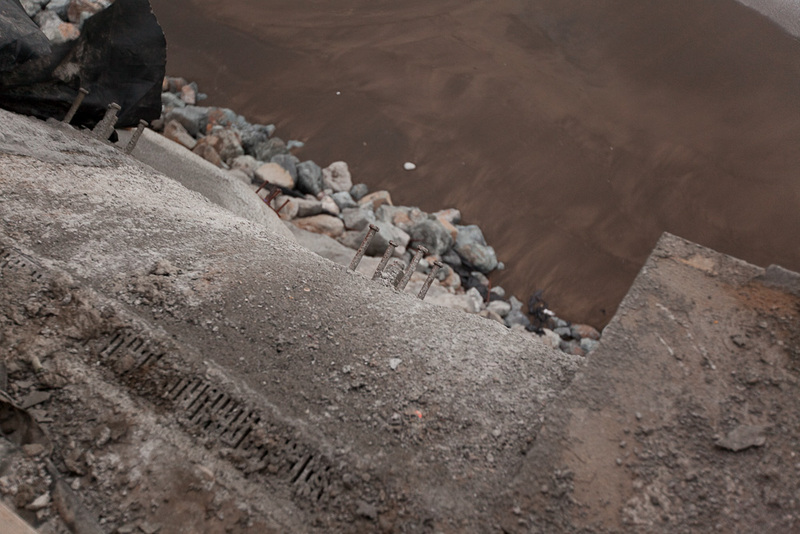 OK, how about that rip rap rock piled along the base of 320 and 330 Esplanade? You can do the last bit of math for yourself, I'm sure! Our hopes and best wishes go out to the folks who still live and own property in harm’s way. We’ve moved a little bit inland, though still in the neighborhood. 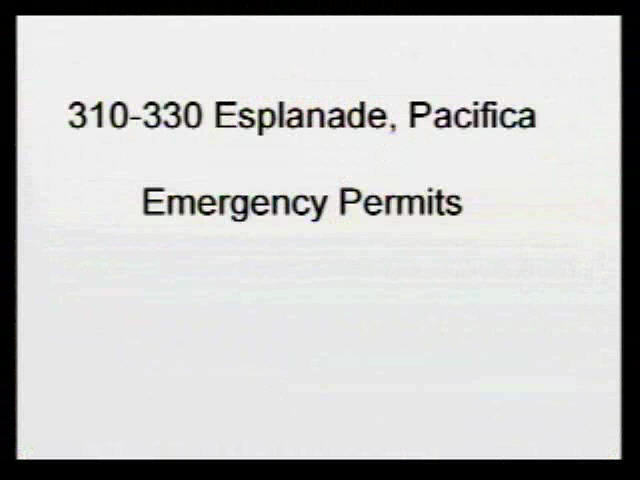 Approval for Emergency Permit No. 2-10-004-G was granted on February 3, 2010 for Farshid Samsami (Owner, 330 Esplanade) and Millard Tong (Owner, 320 Esplanade). 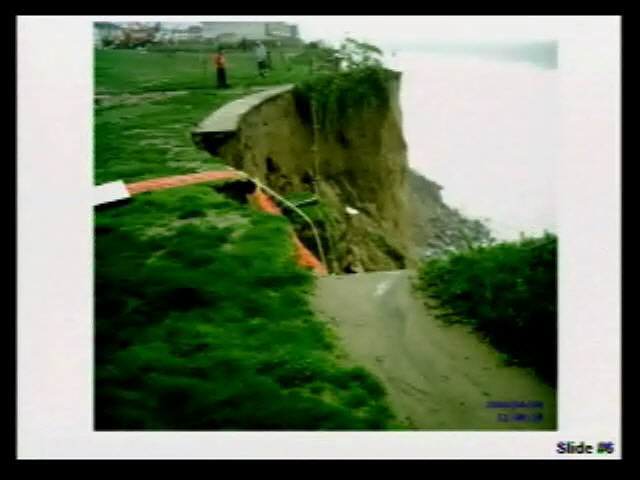 Approval for Emergency Permit No. 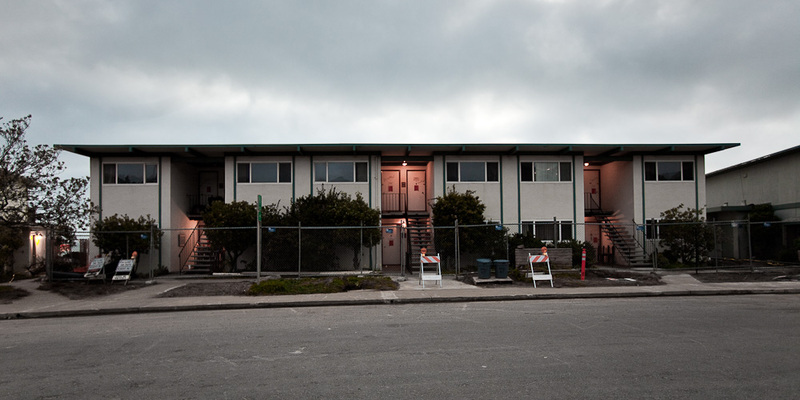 2-10-006-G was granted on February 8, 2010 for AIMCO Esplanade Apartments, LLC (Owner, 360 Esplanade). 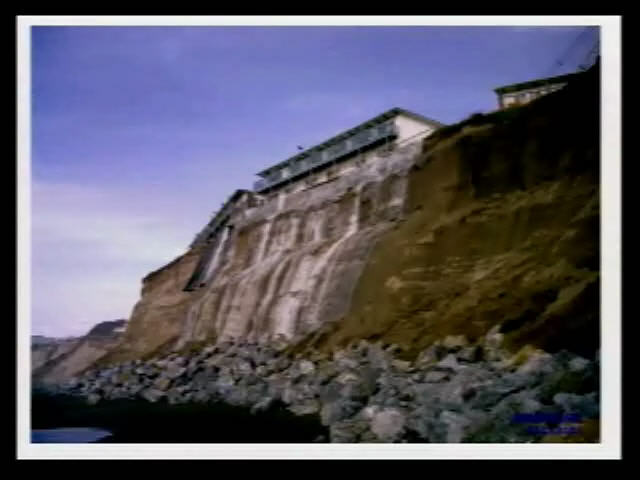 The Executive Director has determined that the following developments do not require a coastal development permit pursuant to Section 13142 of the California Code of Regulations because the development is necessary to protect life and public property or to maintain public services. drainage panels behind the wall facing. 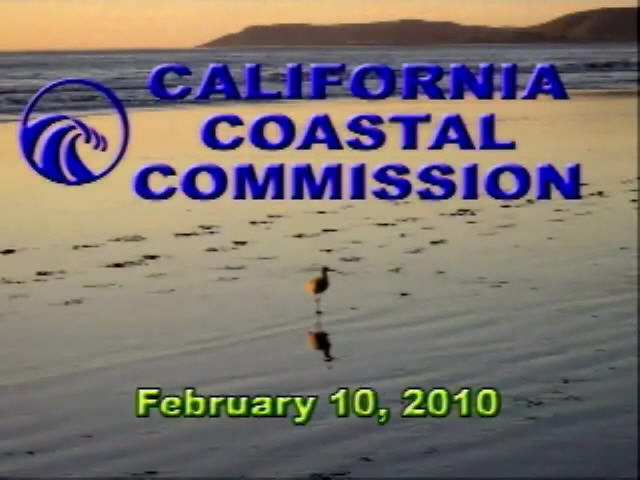 You can download the February 2010 North Central Coast District Deputy Director’s Report from the California Coastal Commission website here (PDF, 8.4 MB). The full report is huge, so I created a much smaller version with only the pages related to Esplanade, and you can download it here: North Central Coast District Deputy Director’s Report, February 2010. I’ve also generated a text-only version of the Esplanade related pages. Note that limitations in the technology involved resulted in typos and a near-complete loss of formatting. You can see that by clicking the MORE link below.